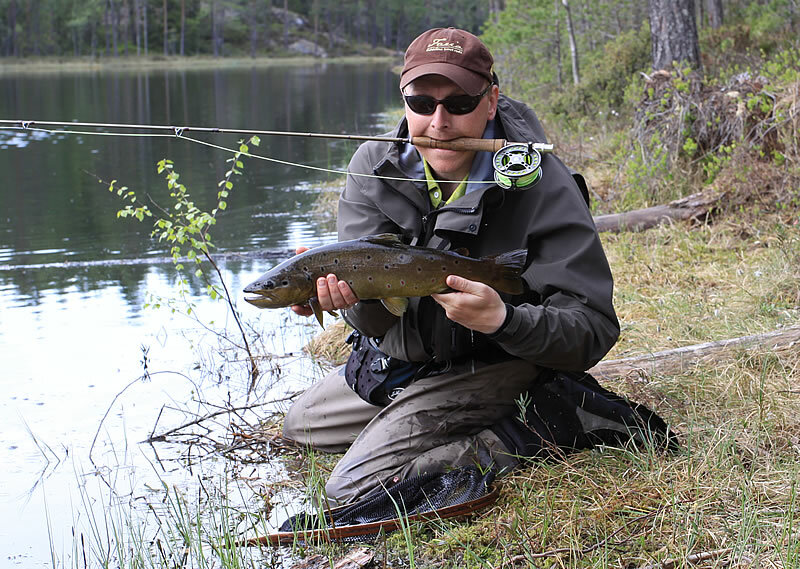 In the southern part of norway these are the days for the annual hatch of leptophlebia mayflies. Where I live it is the smalles one (vespertina) that is on the go now. Yesteday I went to a nice lake that has a fair amount of larger fish. The hatch was really good between 12 and 2 with at lot of freshly emerged flies on the water. But very few fish where rising, and when they did it was typical nymph/emerger rise. After stirring at my dun and emerger for a while i changed to a rig with two nymphs in size 14. After 3 or 4 casts or so I hooked a great fish that almost got stucked in the trees on the bottom several times before i could net it. 3,7lbs is not an everyday catch in these lakes. 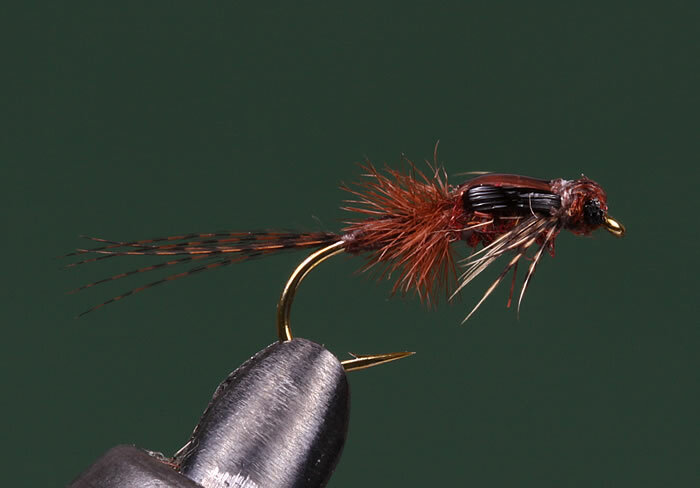 The fly i used is a newer version of an old favorite. I have made it more durable and nicer looking for me and the fish 😉 And it has proven it self to be a great fly at hatches and as a great allround stillwater fly. Hook: Tmc 100 size 14 and 16. Abdomen/wincase: Brown Spanflex or Flexifloss. Wingcase on top/Eyes: Black Spanflex or Flexifloss. Legs: Brown mottled hen saddle or similar. Top view. The abdomen (brown spanflex) is used all the way from tails to the top of the head. Wind it through the ostrich herl, tie it down facing backwards. Tie in the black spanflex, one on each side of the body. Then finish the thorax and legs, stretch all three strands of spanflex forward. Tie down the black ones, one to each side where you want the eyes to be placed. The brown spanflex is tied down all the way to the eye of the hook. Then i dub a small head and stretch the brown spanflex back and tie it down in the “neck” of the head. 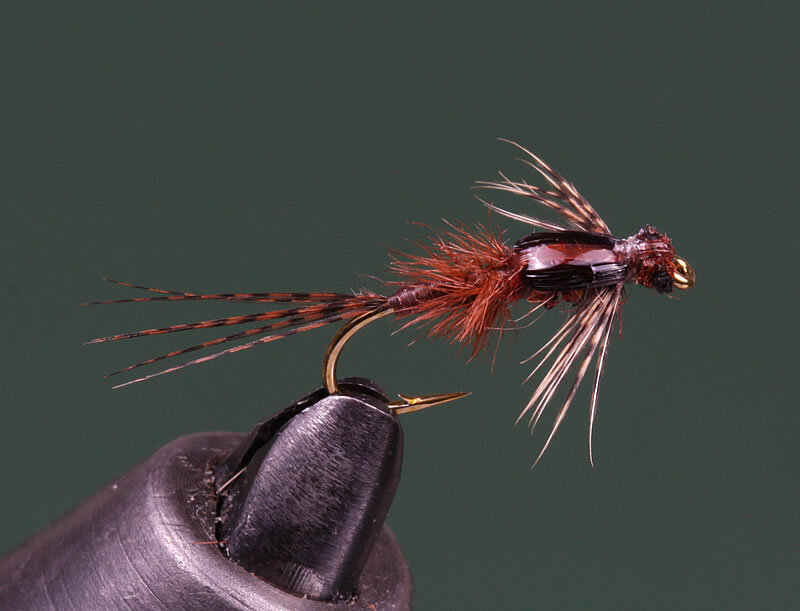 I think this method makes a good looking nymph, and it fish well too.